The Moto X from Motorola impressed everyone with its amazing performance and is also the first device released by Motorola after it got acquired by Google. On the other hand, the Samsung Galaxy Grand 2 is the successor of the Samsung Grand Duos that made a buzz in the marked when it got released. The Grand 2 is also a dual SIM device and also come in an mid-range sector. The Moto X is just launched in India, at a price of Rs. 23999, while the Samsung Galaxy Grand 2 is there quite some time, and it’s available for the price of Rs. 21,500. Let us compare both these devices and see where they stand. The Motorola Moto X has a 4.7 inch display with 1280 x 720 pixel resolutions and where as the Samsung Galaxy Grand 2 flaunts a 5.25 inch display with the same resolution, so here we can easily say that the Moto G has a better viewing experience with better ppi than the Galaxy Grand 2. The Galaxy Grand 2 has the dimensions of 146.8 x 75.3 x 8.9 mm and the Moto x has 129.3 x 65.3 x 10.4 mm dimensions making it easier to hold in hand, but many people like the Smart phones that are big in hand. The Moto X weights just 130 grams that is 33 grams lighter than its competitor which is at 163 grams. The Moto X has a Qualcomm MSM8960Pro Snapdragon dual core processor that clocks at 1.7 GHz where as there is a Qualcomm Snapdragon 400 quad core processor in the Galaxy Grand 2 that clocks at 1.2 GHz. The Moto X is accompanied with Adreno 320 GPU along with 2 GB of RAM and the Galaxy Grand 2 processor is coupled with Adreno 305 GPU and 1.5 GB of RAM. The Samsung Galaxy Grand 2 runs on Android 4.3 Jelly Bean Operating System where as the Motorola Moto X will be running on the latest Android 4.4 KitKat OS since it is acquired by Google. Here we can easily say that Moto X is a clear winner in terms of the internal specifications and the OS is advanced supporting almost all the apps on Google Play. The rear camera on the Moto X is at 10 MP where as the Samsung Galaxy Grand 2 has an 8 MP rear camera. Both the device has autofocus and LED flash so there is no point in finding much of difference in these cameras. The front camera on the Moto X is at 2 Mp and the Galaxy Grand 2 has a 1.9 MP camera on the front. The internal storage on the Moto X is at 16 GB but it cannot be extended as it lacks a micro SD card slot, where as the Samsung Galaxy Grand 2 has a 8 GB internal memory that can be extended up to 64 GB via Micro SD card slot. The Moto X has 4G LTE connectivity but Samsung Galaxy Grand 2 lacks it but most of the other connectivity’s are similar as we can see from the table given below. The Moto X is priced at Rs. 23,999 in India where as the Samsung Galaxy Grand 2 are priced around Rs. 21,500 in India. There is not much of a difference between both the devices in terms of the price but Moto X is a more power full device with better display and an upgraded OS that will be supporting more apps and Games since its Google acquisition. 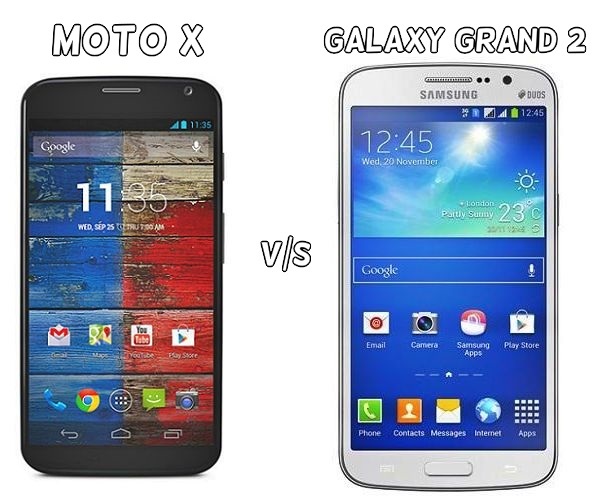 So I would rather be obliged in suggesting Moto X if you are in a tangle to choose between these two devices.